The Daily Stoic: 366 Meditations on Wisdom, Perseverance, and the Art of Living is now available. It features not only 366 all-new translations of brilliant stoic passages but 366 exciting stories, examples and explanations of the stoic principles from Marcus Aurelius, Seneca and Epictetus but also some of the lesser known but equally wise stoics from Zeno to Cleanthes to Chrysippus. The book takes the reader on a daily journey through practical, pragmatic philosophy. 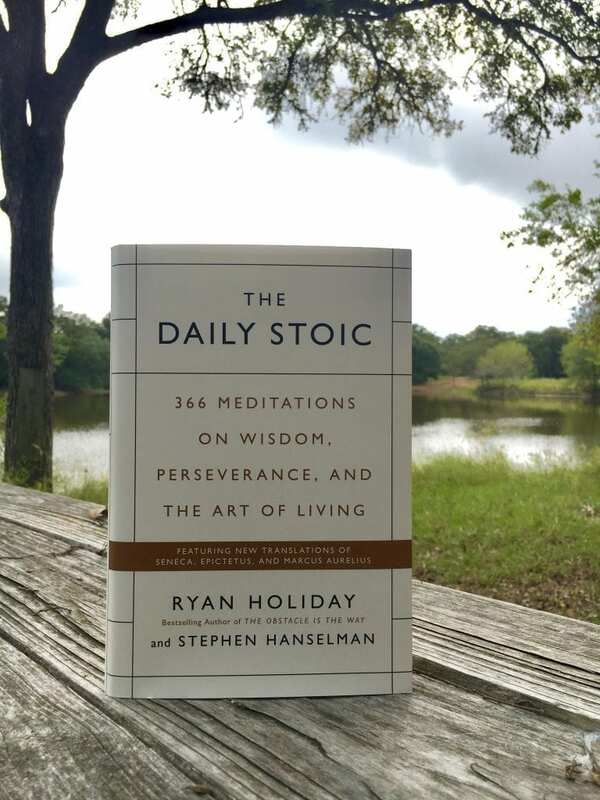 Each day offers a new stoic insight and exercise. By following these teachings, you’ll find the serenity, self-knowledge and resilience you need to live well. Below you’ll find the next 7 days excerpted from the book – seven days of stoic thinking to help you live better, more resiliently and more peacefully. If you enjoy the following we encourage you to order the book online to guide you through the rest of the year. Whatever it is, whatever you’re going through, there is wisdom from the Stoics that can help. It’s pretty obvious that one should keep away from the wicked and two-faced as much as possible—the jealous friend, the narcissistic parent, the untrustworthy partner. At first glance, Marcus Aurelius is reminding us to avoid false friends. But what if we turn it around? What if, instead, we ask about the times that we have been false to our friends? Ultimately that’s what Stoicism is about—not judging other people’s behavior, but judging our own. We’ve all been a frenemy at one point or another. We’ve been nice to their face—usually because there was something in it for us—but later, in different company, we said how we really felt. Or we’ve strung someone along, cared only when things were going well, or declined to help even though someone really needed us. This behavior is beneath us—and worth remembering the next time we accuse someone else of being a bad friend. When a dog is barking loudly because someone is at the door, the worst thing you can do is yell. To the dog, it’s like you’re barking too! When a dog is running away, it’s not helpful to chase it—again, now it’s like you’re both running. A better option in both scenarios is to give the dog something else to do. Tell it to sit. Tell it to go to its bed or kennel. Run in the other direction. Break the pattern, interrupt the negative impulse. The same goes for us. When a bad habit reveals itself, counteract it with a commitment to a contrary virtue. For instance, let’s say you find yourself procrastinating today—don’t dig in and fight it. Get up and take a walk to clear your head and reset instead. If you find yourself saying something negative or nasty, don’t kick yourself. Add something positive and nice to qualify the remark. Good habits have the power to drive out bad habits. And habits are easy to pick up—as we all know. What’s the meaning of life? Why was I born? Most of us struggle with these questions—sometimes when we’re young, sometimes not until we’re older. Rarely do we find much in the way of direction. But that’s simply because we miss the point. As Viktor Frankl points out in Man’s Search for Meaning, it is not our question to ask. Instead, it is we who are being asked the question. It’s our lives that are the answer. No amount of travel or reading or clever sages can tell you what you want to know. Instead, it is you who must find the answer in your actions, in living the good life—by embodying the self-evident principles of justice, self-control, courage, freedom, and abstaining from evil. Alexandria, the city in Egypt, still bears the name of its founder, Alexander the Great, some 2,300 years after he set foot there. How cool would it feel to have a city named after you for so many centuries? To know that people are still saying your name? Here’s a thought: it wouldn’t be cool. Because, like Alexander, you’ll be dead. You’ll have no idea whether your name lasted down through the centuries. No one gets to enjoy their own legacy—by defi- nition. Worse, think of all the horrible things Alexander did to achieve what he did. He fought pointless wars. He had a terrible temper—even killing his best friend in a drunken fight. He was ruthless and a slave to his ambition. Is he really so admirable? Instead of wasting even a second considering the opinions of future people—people who are not even born yet—focus every bit of yourself on being the best person you can be in the present moment. On doing the right thing, right now. The distant future is irrelevant. Be good and noble and impressive now—while it still matters. IT’S EASY TO GET BETTER. BUT BETTER AT WHAT? Self-improvement is a noble pursuit. Most people don’t even bother. But among those who do, it’s possible for vanity and superficiality to corrupt this process. Do you want six-pack abs because you are challenging yourself and committing to a difficult goal? Or is it because you want to impress people with your shirt off? Are you running that marathon because you want to test your limits or because you’re running away from your problems at home? Our will shouldn’t be directed at becoming the person who is in perfect shape or who can speak multiple languages but who doesn’t have a second for other people. What’s the point of winning at sports but losing in the effort to be a good husband, wife, father, mother, son, or daughter? Let’s not confuse getting better at stuff with being a better person. One is a much bigger priority than the other. It’s easy to blame our circumstances. One person curses that they weren’t born taller, another that they’re not smarter, with a different complexion, or born in a different country. It’d be hard to find a single person on this planet—from supermodels on down—who doesn’t think they’re deficient in at least some way. But whatever your perceived deficits are, remember that there are positive qualities that you can develop that don’t depend on genetic accidents. You have the choice to be truthful. You have the choice to be dignified. You can choose to endure. You can choose to be happy. You can choose to be chaste. You can choose to be thrifty. You can choose to be kind to others. You can choose to be free. You can persist under difficult odds. You can avoid trafficking in gossip. You can choose to be gracious. And honestly, aren’t the traits that are the result of effort and skill more impressive anyway? Today, we could hope that goodness comes our way—good news, good weather, good luck. Or we could find it ourselves, in ourselves. Goodness isn’t something that’s going to be delivered by mail. You have to dig it up inside your own soul. You find it within your own thoughts, and you make it with your own actions. This was an exclusive excerpt from The Daily Stoic: 366 Meditations on Wisdom, Perseverance, and the Art of Living now available.